This flat, 3/32" wide vinyl craft lacing is pliable and thin enough to fit standard size beads, yet strong enough to hold them. Rexlace is great for a wide variety of projects, including making lanyards, key chains, zipper pulls, bracelets, barrettes, and earrings. It can also be used for stringing beads or weaving lacing into leather goods such as belts and wallets. Head bands, barrettes, and a variety of other objects can be wrapped in colorful Rexlace. Non-toxic, latex free, and non-flammable, Rexlace is safe even for young children to work with and wear. It is available in an array of brilliant colors, and its non-bleed formulation will not discolor skin or clothing. 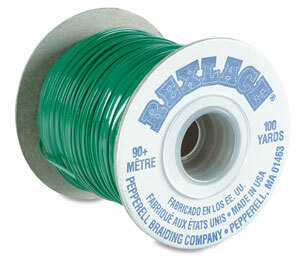 Each spool contains 100 yards (91 m) of lacing. These spools are a great value for recreation centers, camps, scout groups, and schools.